“Welcome to the land of the chambo”, said a jovial immigration officer at Kamuzu International Airport in Lilongwe, Malawi, as we arrived for the 12th Community-based Adaptation Conference (CBA 12). Chambo is a local word in Malawi for a type of freshwater fish known as tilapia. Ours was not a culinary journey, but the temptation to sample the chambo got the better of us. A friend took us to a nearby restaurant where we met two other conferees who also wanted to taste local cuisine. We were not disappointed by the taste of the chambo. We said our goodbyes to the restaurant staff and went back to our hotel to prepare for the conference. 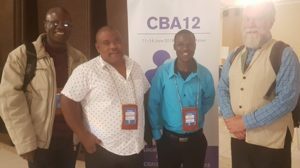 The CBA 12 conference was held in the lavishly chandeliered auditorium at the Crossroads Hotel in Lilongwe from 11 – 14 June 2018. More than 200 people from 45 countries and more than 100 organisations and various other institutions, attended the conference to share experience and new perspectives for locally-driven climate action. The workstream covered ways to collate and analyse experiences of local climate adaptation and to generate and promote policy relevant evidence. Conferees got the opportunity to explore new methods and shared learning on the topic. This workstream sought to build a shared understanding of DCF, drawing on learning from a range of experiences. DCF approaches build financial, planning, and project management capabilities at local government and community level. They establish inclusive structures within existing governance frameworks so as to ensure that investments in public goods for climate adaptation are identified and prioritised by local communities. This workstream explored how ‘technology’ can be used to increase investment in and implementation of adaptation. It built on the fact that, “rightly or wrongly, ‘technology’ tends to grab the interest of policy-makers, the private sector, donors, even communities and households themselves”. Chris Henderson from Practical Action had this to say about the role of technology, “If technologies are to meet the needs of these farming communities, they need to build on smallholders’ assets, be affordable, reliable (low risk), and work in the long term. Such technologies are most likely to be adopted and lead to adaptation at scale”. The ‘Dragons Den’ was key for us. The dragons den was about DCF and pitching on how to secure adaptation funding from investors. Different organisations pitched their funding proposals to potential funders who in turn gave a constructive feedback on all the six proposals. That was a learning opportunity to see what donors look for and how to make your pitch. What emerged from the dragon’s den discussions was that DCF aims at poverty reduction and that DCF programmes should be truly transformative. The conference was graced by Mrs. Mary Robinson, the former President of Ireland and former UN High Commissioner for Human Rights. Mrs. Robinson highlighted the importance of valuing ‘lived experience’ in climate discussions. Mrs. Robinson called on gender responsive community-based adaptation policies based on the concept oftalanoa. Talanoa is a traditional word used in Fiji that reflects inclusivity. A talanoa is an inclusive, participatory conversation. A talanoa breaks barriers and extends boundaries added Mrs. Robinson. Similarly, CBA 12 was a talanoa as it included climate negotiators, policy makers, private sector representatives, practitioners and grassroots representatives. Hot on the heels of Mrs. Robinson was a touching presentation by Constance Okolette Achom from Uganda. She said that she was not even aware that the work she was doing with other village women in Uganda was about community-based adaptation to climate change. Her realisation came when she began working with some non-governmental organisations. She now speaks at international platforms sharing local and lived experiences of community-based adaptation in Uganda. Hers is a good news story of how grassroots women’s voices can be heard and included in decisions on climate change at local, national and global levels. Elizabeth English, the founder and director of an American organisation known as Buoyant Foundation, discussed innovative floating residences known as amphibious houses. Amphibious houses are designed to adapt to floods. They float when the water levels rise. The Spate Irrigation Network Foundation made a presentation on using floods as an asset for communities. Floodplain can be utilised for agricultural activities. Southern Voices articulated the need for national policies and plans to meet the needs and rights of the marginalised people in climate change adaptation. Simon Anderson from the International Institute for Environment and Development (IIED) made a presentation on how integrated monitoring and evaluation (M&E) systems can help states address climate change. He argued that successful adaptation demands an improved approach to monitoring and evaluation. CBA is participatory. In Mary Robinson’s words, “CBA is about challenging power at all levels, challenging norms and embracing inclusiveness” so as to defang the adverse effects of poverty. Poverty is multidimensional – therefore it is essential that when dealing with it, we use a holistic approach. Hence, when addressing climate change and poverty, an integrated approach is not an option, but a requirement. DCF should aim at reducing poverty. Marginalised voices ought to be heard. Women like Constance from a village in Uganda fought all the way to get her voice heard. She ended up documenting her village experiences on gender and climate change and shared her experiences globally. A gender climate talanoa is imperative if CBA is to succeed. As the climate change talanoa drew to an end on 14 June, we reflected on the four days of the conference. We agreed that CBA has its finger on the pulse of the people for as long as it is locally driven. We looked around the auditorium and what did we see? Beaming faces of hope, determined to make a difference as we grapple with the unknown unknowns of the future. At 5pm, the conference was officially closed, and it was time to tuck into a delicious dish of chambo served with Malawi rice. This entry was tagged adapt, CBA, climate change, communities, community-based adaptation, conference, grassroots, IIED, Malawi. Bookmark the permalink.